There are growing concerns in advanced economies that the offshoring of production activities might be followed by the offshoring of innovative activities. This article presents the findings of a new OECD study that investigates the interdependence between production and innovation in the cross-border investments of multinational enterprises. The econometric results do not provide support for the view that co-location with production is a decisive factor in the location choice of R&D and innovation by multinational enterprises. With the emergence of global value chains (GVCs), production processes have become increasingly fragmented and dispersed across different countries. R&D and innovation have typically been among the least internationalised functions of the value chain and were traditionally considered as ‘core activities’ to be retained close to companies’ headquarters. But despite the important ‘home bias’ in global innovation, unbundling has recently also affected R&D and other innovation activities and a growing number of firms have offshored R&D and innovative activities to foreign locations. The offshoring of R&D and innovation poses new challenges to economic policy in OECD and emerging economies. Virtually all governments in emerging economies are keen to attract international investments by multionational enterprises (MNEs), particularly in high-tech, R&D and innovation activities. As MNEs are leading actors and coordinate GVCs, attracting affiliates of foreign MNEs directly facilitates the integration and upgrading of countries in GVCs. But despite the fact that MNEs can provide countries with access to investment, knowledge and technology, spillovers from MNEs to the host economy do not occur automatically and in some cases might not materialise at all . There is a growing concern in OECD economies that because of co-location effects between production and innovation, the loss of certain manufacturing/assembly activities may result in a loss of innovative capabilities (R&D, design, etc.) in the longer-term. The loss of core manufacturing activities may set off a reaction, which will subsequently erode adjacent activities in the value chain, both upstream and downstream, including activities related to innovation and design, all of which could eventually weaken the competitiveness of OECD countries (see the discussion on the “erosion of the commons” ). OECD research based on the fDi Markets database has analysed the importance of co-location within ‘global’ cities. To define global cities, we make use of a classification developed by Mastercard  ranking cities according to various dimensions, among which are knowledge creation, economic stability, financial transactions, political and legal stability, and livability. To define the boundaries of each global city in order to assign investment projects, we draw among others on the OECD methodology of metropolitan regions. The research focuses on more than 118,000 cross-border greenfield investments (i.e. new and expansion projects that result in new jobs and capital investments) by MNEs across all countries, industries and activities for the period 2003-2011. Close to 5,000 cross-border investments relate to innovation projects; innovation has been defined very broadly in the study and includes pure research, as well as R&D, development, design and testing. While OECD economies are still the largest actors in international investment, the BRIICS countries (Brazil, China, India, Indonesia, the Russian Federation and South Africa) are rapidly catching up, both as investors (outward investment) and as locations for inward investment. Over the period 2003-2011 the BRIICS economies accounted for about one-quarter of inward investments, a figure that has since then only gone up. Production activities are still the most internationalised (about two-thirds of cross-border investment projects), but other activities along the MNE value chain are becoming increasingly dispersed across countries. As can be seen in Figure 1, sales, marketing and support represent the largest category of upsteam and downstream support activities, while headquarters and innovative activities accounted for about 25 per cent of the support activities. The financial crisis of 2007/2008 has resulted in a significant decrease in cross-border investments, including innovative projects. Afterwards international investment picked up again, with especially more applied projects like design and testing driving the growth in innovative projects. Source: Calculations based on fDi Markets database. ‘Global’ cities are major locations for inward and outward investment projects in R&D and innovation. About 40 per cent of R&D and innovation investments are done by MNEs headquartered in a group of 57 global cities, in particular Paris, Tokyo, London, Munich and New York. Reversely, more than 40 per cent of investments in innovation are directed towards these 57 global cities. Major cities in Asia like Shanghai, Bangalore, Singapore, and Beijing have attracted more than 100 of these projects, especially more applied activities (development, design and testing). Econometric analysis suggests that international connectivity of locations (e.g. airports) and local universities’ research are particularly important for the location of cross-border investments in R&D and innovation. In addition, cost factors like the average wage levels for skilled employees in cities, the corporate tax rate, and fiscal R&D incentives are also found to play an important role in MNEs’ location decisions, particularly when potential locations satisfy key conditions concerning basic infrastructure. Suprisingly, no major differences in location factors were observed between pure research and more applied investment projects in innovation. In contrast to previous studies     , the analysis finds no evidence of co-location between production and innovation. MNEs do not seem to follow up prior investment in production activities abroad with R&D/innovation investments. Differences across industries are, however, observed with co-location effects more important in engineering intensive industries which are typically characterised by short product life cycles and continuous innovation in processes. But overall, we find no evidence that prior investment in production activities abroad leads firms to follow up with R&D investments. The often heard claim that the offshoring of production today will result in the offshoring of R&D and innovation tomorrow is not supported. The evidence only indicates that when firms decide about the location of R&D abroad (i.e. after the decision to offshore has been made), they tend to prefer locations where they have already set up production activities. The results also indicate that the offshoring of R&D and innovative activities does not hurt innovation at home (measured by the growth in patents in the home city). Rather, the evidence suggests that, if anything, outward investments in R&D and innovation – particularly if they concern development, design and testing – increase MNEs’ innovation activities in their home city. 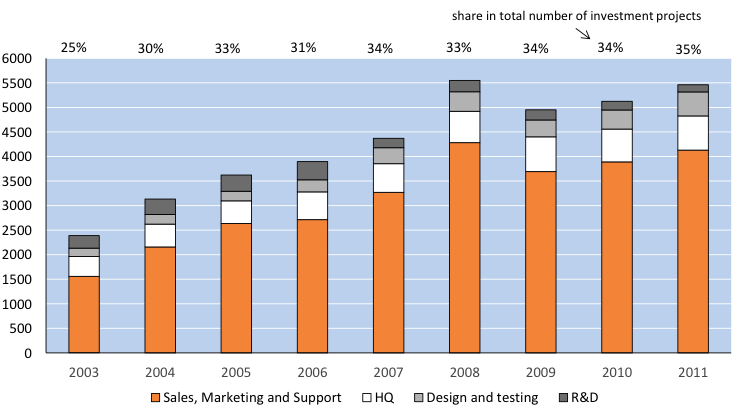 This confirms the notion that innovation activities at home and abroad are often complementary: (foreign) investments in development, design and testing build on the results of R&D efforts (at home), while reversely the market expansion effects of (foreign) development, design and testing facilitate R&D expansion at home. These findings demonstrate – in line with previous research – that international investments in innovation generate knowledge flows across borders within MNE networks. Cross-border knowledge transfers combined with a global cost optimisation of companies’ R&D/innovation activities are essential factors in MNEs’ competitiveness and growth prospects. This also means that the benefits of policy induced investments are likely to spread internationally. National or subnational policies to provide incentives for (both foreign and domestic) MNEs’ investments are likely to generate knowledge flows and productivity effects abroad as well as domestically. The more interconnected the global economy becomes, the higher the risk of leakage effects from domestic policies. This post is based on the article “Where to Locate Innovative Activities in GVCs?”, by Rene Belderbos, Leo Sleuwaegen, Dieter Somers and Koen De Backer, published in OECD Science, Technology and Industry Policy Papers (no. 30), 2016. It represents the views of the authors and not those of the GILD blog, nor the LSE. Koen De Backer is a Senior Economist at the OECD within the Science, Technology and Innovation Directorate. OECD (2011), “Attractiveness for Innovation: Location Factors for International Investment”, Directorate for Science, Technology and Industry, OECD Publishing, Paris. Pisano, G.P. and Shih, W.C. (2012), “Does America Really Need Manufacturing”, Harvard Business Review, 90 (3), 94-102. Belderbos, R., Van Roy, V., Leten, B. and B. Thijs (2014), “Academic research strengths and multinational firms’ foreign R&D location decisions: evidence from R&D investments in European regions”, Environment and Planning A, 46(4): 920-942. Defever, F. (2006), “Functional fragmentation and the location of multinational firms in the enlarged Europe”, Regional Science and Urban Economics, 36(5): 658-67. Defever, F. (2012), “The spatial organization of multinational firms”, Canadian Journal of Economics/Revue canadienne d’économique, 45(2): 672-697. Alcácer, J. (2006), “Location choices across the value chain: How activity and capability influence co-location”, Management Science, 52(10): 1457-1471. Alcácer, J. and M. Delgado (2013), “Spatial organization of firms and location choices through the value chain”, Harvard Business School: 13-025.